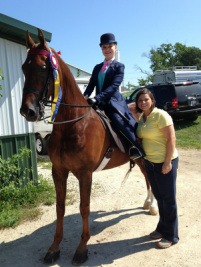 Highland Ridge Stables is owned and operated by Sarah McClintock. After teaching and training both horses and riders since 2000, Sarah decided it was time to take the plunge and run her own stables. Highland Ridge Stables opened in August of 2013. 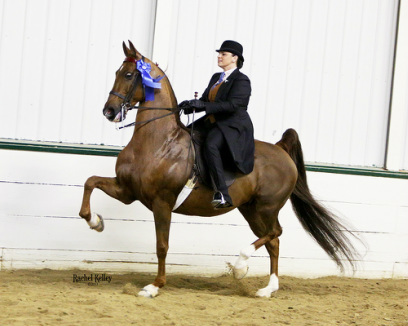 Sarah grew up in Grafton, WI where she owned two American Saddlebred horses of her own. She competed in a local 4-H group and showed at the state expos as well. Aside from caring for her own horses, she worked at a barn helping with summer camps and trail rides. She pretty much did all she could to get to any barn and do anything with horses! Ask anyone who knows Sarah and they can tell you she works hard and is up front and honest. Sarah's work ethic has contributed hugely to every barn she has ever been employed. She has the patience and follow-through to teach riders from the beginner ranks and develop them into a show ring winner. As a trainer, Sarah McClintock has experience taking horses and riders and putting them together as a team that dominates in the show ring. She has a keen eye for working with horses and riders and getting great results! Numerous state, regional, and even world and reserve champions have been the product of Sarah's work and attention to detail. Let Sarah and Highland Ridge work for you! Sarah resides at the farm where she lives with her husband, Tony, their dogs Mason and Emmy and cat, Max. 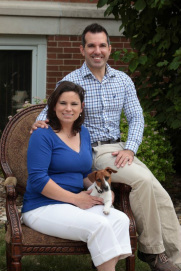 Tony is a real estate agent for Shorewest and works out of the Oconomowoc office. Sarah and Tony enjoy playing board games like Qwirkle and Blokus. They love watching movies or shows on HGTV. We both have a weakness for pizza and anything with chocolate.